Poppy Seed Hut01874 676446work01874 676416fax Self-cateringThis whimsical and cosy hut sits nestled in the heart of the village of Gilwern; the perfect location for couples to grab that romantic getaway, the hut is within walking distance of several local pubs and shops, and walking and cycling routes. Created out of what would ordinarily be used as a BBQ Lodge, the owners have lovingly turned it into a secret bolthole, nestled away in their garden. The innovative design means the space has been maximised. With an open plan layout, the hut offers everything that would be required including a small kitchen with fridge, toaster, kettle and microwave. There is a comfortable sofa and a TV with the basic Sky package. The separate bathroom has been cleverly fitted in and has a bath with shower attachment, hand basin and toilet. The mezzanine style 'bedroom' is accessed via steep ladder stairs and has a double mattress with mood lighting! Outside there is a patio area with seating and bike rack. The village of Gilwern has a small general store, chemist, post office and a fantastic fish and chip shop as well as 3 pubs; you can also join the Monmouth and Brecon Canal path. Just a short drive away are the market towns of Crickhowell and Abergavenny, with their weekly Farmer's Markets where you can buy an array of organic and local produce. This whimsical and cosy hut sits nestled in the heart of the village of Gilwern; the perfect location for couples to grab that romantic getaway, the hut is within walking distance of several local pubs and shops, and walking and cycling routes. 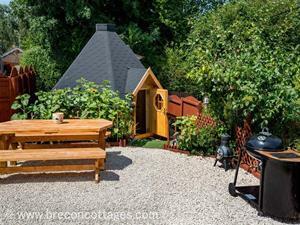 Created out of what would ordinarily be used as a BBQ Lodge, the owners have lovingly turned it into a secret bolthole, nestled away in their garden.